VERY LIMITED QUANTITY! You will enjoy wearing our awesome Medical ID Bracelet made of braided macrame satin and is adjustable with a drawstring to fit wrists between 6 - 9 inches. 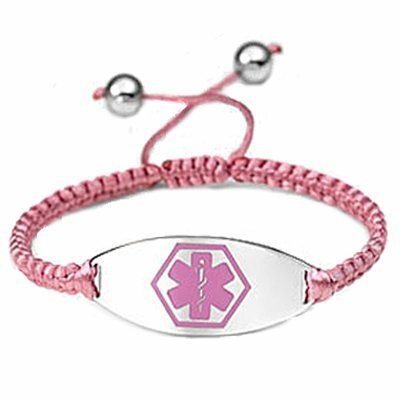 Stainless Oval medical ID tag features the "star of life" medical emblem in Pink. This item is not available for further discounts. Medical Tag measures 1-1/2" x 5/8"
Fits wrists 6" - 9"
Do not order if your wrist does not fall betwen these sizes. Re-sizing not available. Bracelet should not be worn in water.